A lot of powerful people have taken Truman's advice to heart. President Obama, like many of his predecessors, has a canine companion: Bo. But while Bo may be the most famous dog in DC, Bravo is probably the most powerful one. 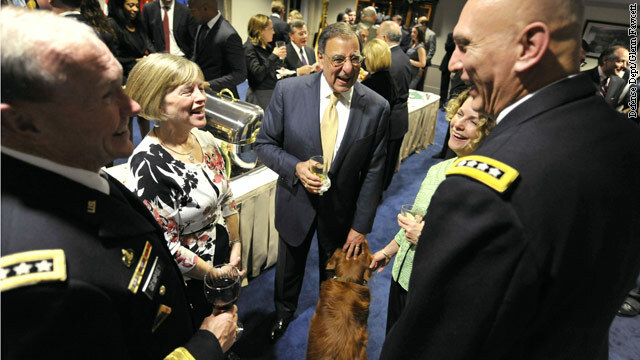 Bravo is Secretary of Defense Leon Panetta's golden retriever, though he has a distinctly auburn, not golden, coat. Panetta, whose family stayed in California when he moved back to Washington to work for the Obama administration, brought Bravo with him. If you work in DC, you may spot Panetta letting Bravo play on the Pentagon parade grounds. He's even out of uniform (meaning he's off his leash). People close to the secretary says it's not unusual to see Bravo sitting in on meetings with the nation's top military leaders. In fact, it's said the Pentagon's top dog holds the highest security clearance. George Little, who has worked for Panetta since he was CIA director, said, "Bravo knows all the details of the bin Laden raid." If knowledge is power, that moves Bravo ahead of Bo on the DC power scale. Bo's rarely seen in top Oval Office meetings. We did not get any comment from the secretary about DC's canine power rankings. Now, you may see the name Bravo and think it's got a military connection; after all, the word bravo is commonly used in military-speak. But Little said it has nothing to with the military. Apparently, when the dog was a puppy, he was being well-behaved, and Panetta, who is Italian-American, told him "bravo," which is Italian for "well-done." Still, people on Panetta's staff like to say that "the Pentagon is in Condition Bravo." Those Defense Department wonks love their lingo. Put him in charge, he couldn't do much worse than Panetta. Golden Retrievers ARE the greatest and most powerful dogs! LOL Enjoy your stint in The Pentagon Bravo! !